I together with my niece, bestfriend and her son, recently took the challenge to learn on how to swim in a day, while beating the heat in the metro. This will benefits us a lot whenever into the water and at the same time lower the body temperature that we are feeling almost everyday. Happen at the City Club Alphaland, Streamline Sports Instructions (SSI) initiated to teach us (toddlers, kids, teens and adults) on the basics of swimming. These includes proper breathing, hand forms, lower body proper movements and more. Though we didn't learn the laps into the pool but we really learned a lot from them in a very short period of time. Streamline Sports Instruction was established in 2014 as a swim coaching business with an expanding interest in triathlon coaching and multi-sport events. 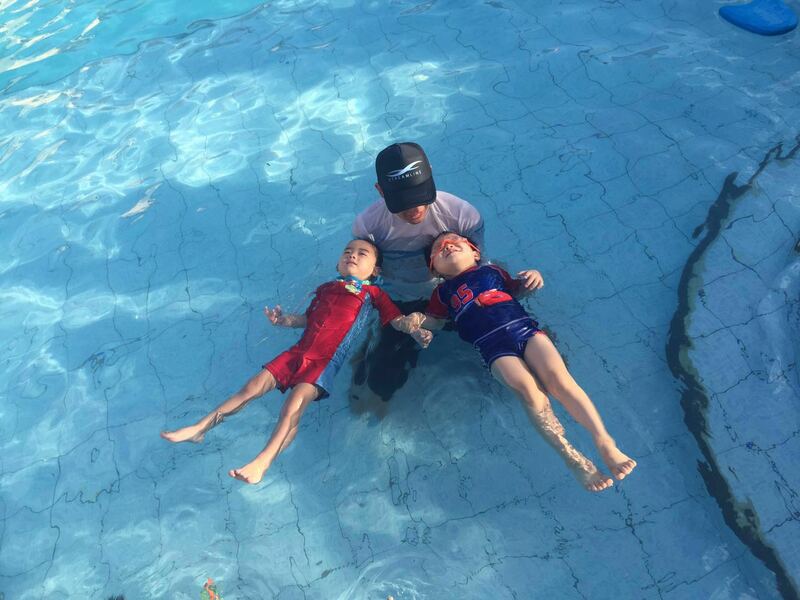 They caters to all ages and provides high quality swim instruction around the metro like Makati, Pasig, Quezon City and Taguig City. “Swimming is for everyone. You can learn at any age and still be good at it, with the right teaching approach,” shares Noy Basa, Co-Founder and Head Coach of Streamline Sports Instruction. “We believe in the importance of a healthy and active lifestyle through sports and learning how to swim is a step towards that direction,” ends Basa. I think swimming is really good for the body like from lungs because it will maximized your breathing process, gain body strength because you will use all your body parts to move through the water and helps overall flexibility. It will keep your body fit and healthy :). On the other hand swimming don’t just end with the physical benefits. A research by Mindlab International reported that taking a regular dip at your local pool could make you feel happier. More studies suggest it also helps with stress relief and self-esteem. Swimming will make your mind fit also. According to a Journal of Physiology study, blood flow to the brain increased by up to 14% when men submerged themselves in water up to their heart. Though this could mean more brain activity for you, don’t get your hopes too high. The real magic is with the kids! In an Australian research, it showed that kids who took swimming lessons were able to master language development, fine motor skills, confidence, and physical development sooner than those who didn’t. Don’t you just wish you took swimming lessons as a kid? To get started this summer, why not enroll in a swimming school? Like all exercises, it’s always more effective when we approach learning under the supervision of professionals who use a technically sound and enjoyable form of instruction. With a combined local and international teaching experience of over 40 years, swimming with Streamline Sports Instruction will definitely be an experience you and your kids will enjoy. Go on, grab your goggles, and take a lap with Streamline Sports Instruction, just like we do, we learned, had fun and make worth out of our day with benefits.